Can a Piece of Tape Really Change How We Move or Feel Pain? Absolutely, but maybe not in the way we traditionally think of tape. We do not use it to mechanically strap a body part together or prevent it from moving. Instead, we use Kinesiology tape as “Neurological Stabilization” that guides the way our body moves and perceives motion. It also decreases pain much the same way rubbing your shin does after you bang it on the coffee table late at night. These two effects allow us to move our bodies in the correct pattern rather than compensate around pain or anticipation of pain. It also allows for a mechanical lifting effect that decreases swelling and bruising significantly faster and better. Want more proof? Look at the Olympics, professional sports, or ask someone that has had it done. Or, just ask us! We will be happy to show or tell you the difference. 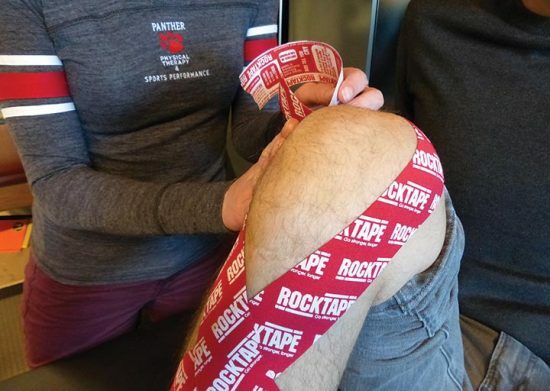 We use RockTape as our Kinesiology Tape because it sticks better, stretches more, and the philosophy is the best.